Audery’s mother experienced a membrane rupture. She had noticed right away & went to the hospital immediately. 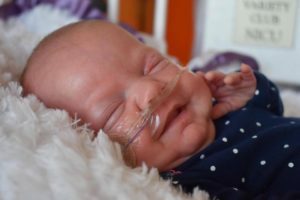 The doctors were able to keep her on bedrest to monitor Audrey for 4 days before they delivered. Audrey was born weighing 1lb 3oz at 32 weeks gestation. When she was 4 months old she weighed in at over 8lbs!!! Audrey has been a fighter throughout her journey and her family is hoping for a discharge soon so they can be home together at last! Please keep baby Audrey in your thoughts & prayers as she continues to work on getting stronger!